It has been my pleasure to have known Dr. Sophronia Ward professionally for over 20 years. In addition to a comprehensive mastery of statistical problem-solving tools and techniques, Dr. Ward presents and trains others in these methods in a way that is easy to understand; especially to those who are new to these tools. Dr. Ward communicates and teaches from a practical perspective, which allows individuals to easily understand and apply these skills within their daily job functions. That ability to effectively apply the proper tools directly to specific problems within the work environment is what drives resolution of the root cause of the issue. By seeking a genuine understanding of the business and its customers, Dr. Ward translates her knowledge and skills in ways that are helpful for her clients as they work to understand the specific process behaviors that drive value for their business. By starting with the customer value that is being generated, Dr. Ward walks the value creation process and maps the flow of value creation using either process maps or value stream maps. As potential process problems are identified, Dr. Ward’s unique ability to ask the right questions and probe the available data helps facilitate the quick discovery of the root causes of those process issues and the subsequent validation of their corrective actions. By guiding and coaching project leaders and team members, Dr. Ward helps solidify in those employees the problem-solving skills which they can utilize daily in their current functional roles within the organization. With regular follow-up and an availability for guidance through difficult steps in the improvement process, employees gain confidence in their own abilities to consistently apply these skills. I met Frony Ward in my Lean Six-Sigma black belt training in 2010 and was immediately impressed with her engaging teaching style and breadth of experience and knowledge. As my project and training progressed, Frony continued to coach and challenge me to think critically and deeply about the problem, what the data was telling me, and how to approach my analysis. I have reached out to her a few times over the years with a challenging data problem and she has always taken the time to listen and ask questions that have helped me to think through the issue. Once, she told me that she had an article to send me about my problem. I was slightly annoyed to find an article about a button factory in my email. American Fidelity is an insurance company and how was that relevant? I read the article and sure enough, my problem was their problem! When we decided to train more green and black belts in 2015, I knew that I wanted Frony to be their instructor. Having worked with Dr. Ward on numerous occasions, I can say that her passion and professional insight are second to none. She helped several of my organizations develop the skills to put real-world, effective continual improvement programs into place. “Frony” truly understands the nature of applied statistics in a business setting, and she is able to communicate that knowledge effectively. She is a delight to work with, and I am proud to call her both a mentor and a friend. I have had the pleasure of working with Frony Ward on Six Sigma training projects in Australia and the United States and have always been impressed at her ability to bring statistics to life in ways that engage and enlighten students. Her ability to simplify statistical concepts without “dumbing them down” has always been one of my favorite things about her gifts as a teacher and mentor. I have also been impressed with Frony’s ability to help students learn to use the tools of Six Sigma (voice of the customer, SIPOC, process behavior charts, etc.) to tell a concise and clear story of how the process is currently behaving. Her IMPROVIT software is truly innovative and easy to use and something I have shared with many clients over the years. Overall, I feel fortunate to have been both a colleague and “student” of Frony’s for almost two decades. As I have watched her guide students and their projects to successful conclusions, I have learned many tools and techniques that have made me a better consultant. I highly recommend this unique and talented professional. I have had the privilege to work with Dr. Ward on numerous occasions, both as her student, and as her client. Dr. Ward has an uncanny ability to make statistics make sense, to coach projects, and to make the statistical techniques used in process improvement relevant to each situation. I was introduced to Sophronia (Frony) Ward after being convinced to pursue a 6-σ Black Belt certification. Sitting as one in a class size of 14, I was curious how the classes would be paced to account for the varied backgrounds in both education and experience. It became clear almost immediately that our training was going to be supplemented with ready access to Frony’s extensive knowledge and experience through one-on-one interaction. Frony has an extraordinary ability to communicate effectively at any level. She was equally at ease whether speaking with touch labor, engineers, accountants, or executive management. When I completed the classes, I found myself not just understanding, but able to use, concepts I had been taught in college, but for which I never recognized a practical application. She made sense of the use of statistics without having to have a background in math. The results of the training were extraordinary! My simple project saved hundreds of thousands of dollars in waste. I was so impressed by the ease of implementation resulting from her guidance, that we hired her to perform Green Belt training for 26 employees at our plant. Our projects covered a wide range of complexity, including scheduling, accounting, product design, and a variety of production processes, yet the results became evident quickly. She has an innate ability to “see” improvement opportunities after asking a few simple questions. For us, these proved relatively simple to achieve and quite profitable. The recognition of progress became an incentive for others to join in the process. Supported by upper management, the enthusiasm was contagious. Frony was able to work with employees regardless of their previous education or skill set. She is both an excellent teacher and a coach. She infuses much of the teaching with humor and interaction and is able to simplify the approach in a manner that makes applying the techniques simple without sacrificing the strength of the underlying statistical analysis. I still enjoy her preference in working with skeptics. She told me that once she taught a skeptic, they would become one of the staunchest supporters of the system. She proved exactly that within our own company. It is a tenet I still use today when designing projects. Frony taught me how easy it can be to recognize just about anything as a process, with its own inputs and outputs, suppliers and customers, and each with their own quality demands. After defining the process it becomes relatively simple to apply 6-σ techniques to foster improvement. Having very successfully employed what she taught me in three separate roles with other companies, I could not be more enthusiastic in recommending Frony for any type of improvement project. I was fortunate to be in the right place at the right time in the fall of 1989. I was working as a Quality Engineer at Hamilton Standard in Windsor Locks, CT. Hamilton was embarking on a Continuous Improvement journey, and Tennessee Associates Inc (TAI) was selected as the consulting company. I left Hamilton in June of 1998 and have been the Manager of Continuous Improvement at Birken Manufacturing Co., Inc, in Bloomfield CT since that time. 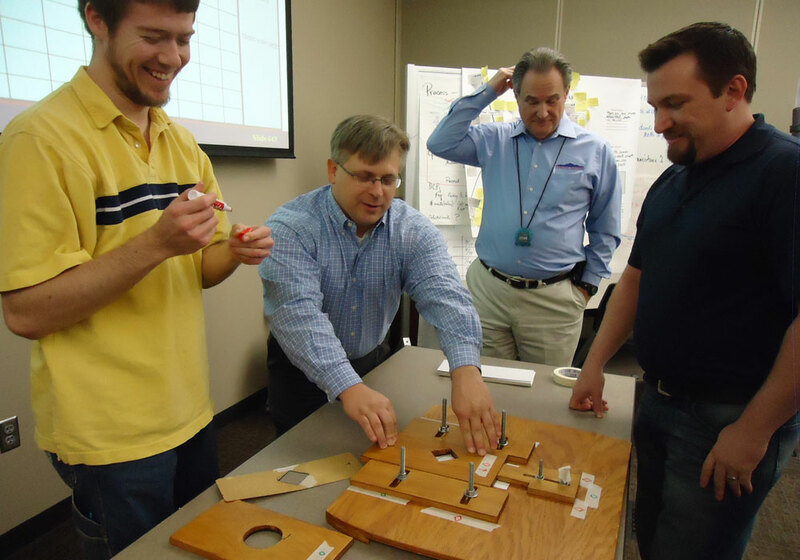 As part of the program, TAI made available to Hamilton, (2) seats at a public Design of Experiments (DOE) course in Tennessee. Each month, for 3 months, I was able to travel to Knoxville for this 3 day at a time, 9 day total, course. Dr. Ward was the lead teacher. I have to say that the DOE training has been a defining element of my career for the past 27 years. Dr. Ward had oversight of, and presented much of the training. F-Tests for statistical significance, Analysis of Variance, Sample Size determination, and Factorial Screening Designs were all covered. The TAI DOE Procedure is something I use to this day. What I really like about DOE and the use of the procedure is how it ties together team skills with technical knowledge. I learned how to facilitate teams through the procedure, and select an experimental design to get answers when other methods to resolve an issue had not yielded an answer. While Dr. Ward and her team taught us many techniques, I have to admit the Factorial and Fractional Factorial designs have been of most use to me in aerospace manufacturing projects. Often, I use the procedure Dr. Ward taught to help teams better understand and define a problem. The result of a couple of hours going through the procedure do not always result in an experiment, but an “aha” moment where a key factor or issue the team had not though of is revealed as a key contributor to better control or understand. 27 years after taking the class, I still have fond memories of my time with Dr. Ward and her team in Knoxville. The workshop format she led was enough to get me the technical and some facilitative skills to help me run or consider at least one DOE each year since that time. I grew to understand and enjoy statistical thinking through her help. Through the continued relationship of Hamilton Standard and TAI, I also took Facilitator Training. Again, the DOE skills, and Facilitator Training from TAI and Dr. Ward have made a difference in who I am and what I have been able to do in my aerospace manufacturing career. I have been fortunate to take what Dr. Ward taught me and develop my own training sessions and presentations to deliver to others as well. I really appreciated the ECCQP training you facilitated for us. It has allowed me to grow with Emerson. I now handle the liability and litigation cases as the product safety officer for the compressor group as well as the regulatory compliance manager. I use the ECCQP principles when analyzing the on site inspections for the liability and litigation cases. Thank you again for support and being a friend.